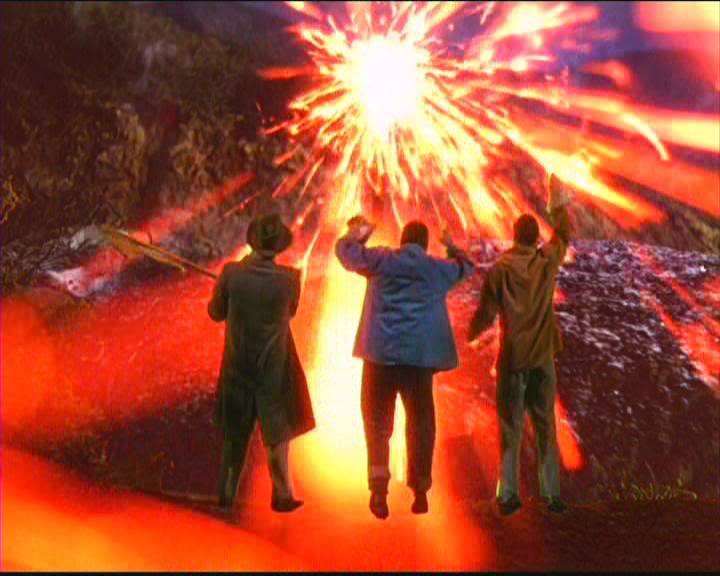 The 1950s film version of H. G. Wells’s The War of the Worlds is the best version of all. Paramount Pictures, 1953, 85 minutes. Producer: George Pal. Director: Byron Haskin. Cast: Gene Barry, Ann Robinson, Les Tremayne, Bob Cornthwaite, Sandro Giglio, Lewis Martin, Jack Kruschen. Narration: Sir Cedric Hardwicke. Inspired by the 1898 H. G. Wells novel. Make no mistake about it, science-fiction, like comic books, is a part of our culture, and George Pal, who produced this latest amalgam of fact and fantasy, is no tyro in this field. 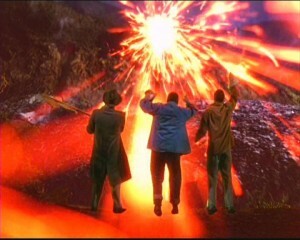 Like his previous sorties into interplanetary space—”Destination Moon” and “When Worlds Collide”—”The War of the Worlds” is, for all of its improbabilities, an imaginatively conceived, professionally turned adventure, which makes excellent use of Technicolor, special effects by a crew of experts and impressively drawn backgrounds. Equally important is the fact that Director Byron Haskin, working from a tight script by Barre Lyndon, has made this excursion suspenseful, fast and, on occasion, properly chilling. the invaders—they’re frightening, spindly, anemic, one-eyed creatures . . .
the nest of Martian machines hovering over the area on electronic beams they send out, also have an “invisible electronic umbrella,” which protects them against the [atomic] bomb. This, of course, brings on a wave of terror with people stampeding from Los Angeles as the monstrous creations start leveling the city before taking over and completing their migration. It’s highly significant, I think, that the good pastor’s cold-blooded murder is all the human defenders need to start shooting—but will it be enough? Does our side win despite these odds? Of course. But it would be unfair, even to a Martian, to divulge the climax. Gene Barry, as the scientist, and the rest of the cast behave naturally, considering the circumstances. As might be expected, however, the cast and even Sir Cedric Hardwicke and his voice of doom narration play second fiddle to the intricate and ominous Martian craft. Mind those heat rays! A sci-fi epic, a horror flick, a love story, even that rare item, a Hollywood movie which has positive things to say about religion—George Pal’s version of The War of the Worlds is all of these, earning our recommendation.